This very useful practice guide gives quick and easy access to the case law of the Union courts on merger control. It presents the relevant parts of all judgments on the EU Merger Regulation by topic, allowing the reader to quickly find what the Court of Justice or the General Court of the European Union has held on a particular issue. A highly detailed table of contents facilitates prompt access to the relevant precedents. 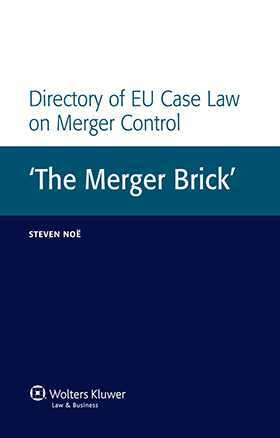 The work is intended for all those interested in EU merger control and is particularly relevant for practitioners handling merger control cases in Europe. Steven Noë is a member of the Legal Service of the European Commission. He has practised EU law and competition law in particular for many years, first at the Dutch bar and since 2004 in the Commission's Legal Service, where he is responsible for merger coordination. He regularly defends the Commission in merger cases before the courts of the European Union. Chapter 1 Lists of Cases. Chapter 3 The Scope of Application of the Merger Regulation. Chapter 4 General Principles for the Appraisal of Concentrations under Article 2. Chapter 5 Anticompetitive Effects of Concentrations: Non-coordinated Effects. Chapter 6 Anticompetitive Effects of Concentrations: Coordinated Effects. Chapter 9 Procedure before the Commission. Chapter 10 The Duty to State Reasons in the Decision 501. Chapter 11 Action for Annulment. Chapter 12 Action for Damages. Chapter 13 Specific Procedural Issues in Court Proceedings. Chapter 14 Results of Court Actions. "Given the highly demanding field of merger control and the tight time frames under which lawyers are expected to operate, Steven Noë’s book is destined to be a well-thumbed addition to a practitioner’s library. Researchers and students of competition law will also find the book extremely useful as a companion to their textbooks."